EAST OF INDIA WEDDING CARD MARRIAGE LUCKY SIXPENCE OLD NEW BORROWED BLUE BRIDE. A4 sheet of 35 stickers East of India Happily Ever After. 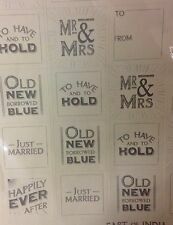 Various designs on the sheet including Happily Ever After, Old New Borrowed Blue, To Have to Hold, Mr & Mrs etc. An East of India card with the words 'For Richer For Poorer' with one old style penny on the front. An East of India card with the words 'Wishing You Lots of Luck'. East of India - Wedding save the date - Pencil is in. Your wedding guests will not forget your wedding date with this beautiful card. The card is blank on the inside. 'Special Bridesmaid'. This simple but beautiful love heart shaped card features the words. Wherever possible we do try & re-use all our cardboard boxes. We endeavour to answer your queries within 48 working hours. Colour Cream. EAN 5039041055804. ISBN Does Not Apply. Display Type Special Bridesmaid giftcard. Tout petit. Catégories populaires. Liens utiles.